I was born in Vijayawada and brought up in Vijaya Nagaram. I did my degree and law in Maharaja college in Vijayanagaram. Then I practiced law for a year in Vijayanagaram. I know Reddy of Kranthi Films in Vizag well. I used to come to Hyderabad to take prints for the films he distributed. I am also genuinely interested in watching films since childhood. I am huge fan of Amitabh Bachchan and watched all his films multiple times. I got introduced to Seenu Vytla, Vinayak and Bujji through Kranthi Reddy. Then I shifted to Hyderabad and started staying with Bujji and Vinayak in Journalist colony in Jubilee hills. It was before Seenu Vytla made Anandam and Vinayak made Aadi film. After the success of Aadi, Bujji announced that he would make a film with me as a director in one year. I worked for Anandam and all films of VV Vinayak. More than the directorial talent, I learnt more about human side from VV Vinayak. I learnt discipline, working style and down-to-earth attitude from Vinayak. I got an idea for interval point first. Then narrated it to my friend Deepak. He liked it and I completed the basic story line and narrated it to Bujji and D Suresh Babu. They okayed the project and asked me to complete dialogue version. After that I approached Siddhardh. After the narration he got up, hugged me and told me that he can understand how much I worked on the script. He understands the difficulty and hard work that goes into making such scripts as he worked as an assistant to Mani Ratnam before becoming an actor. What is KIKK all about? KIKK is all about what it takes for two people to be together. It could be any relationship (siblings, parental, lovers etc). This film is about how to sustain bonding between two people. There is always a thin and fragile thread that keeps a relationship together and we should learn to respect others and compromise in order to keep the relationship alive. Everything in love comes with a tag (kastam). If you like (istam) something, you should be prepared to pay for that tag (kastam). If you want a rose, you should be ready to be pierced by a thorn. The bigger the desire of yours, you have to go through many more struggles. 1. To keep the relationship alive by giving whatever it takes. 2. The bigger the goal is, the harder the struggle. 3. Life is a journey. Enjoy the journey. Don't try to reach the destination without enjoying the journey. Chandrabose wrote beautiful lyrics about journey of life in KIKK - "Saripodoi batakatam. Nerchey jeevinchadam' (Don't just survive. Live your life!). Bujji produced mass flicks like Lakshyam and Lakshmi in the past. But those people who are close to Bujji realize that he is a sensitive man with lots of emotions. Bujji is a sentimental guy. If you narrate him a heart-touching incident, he will cry. If he sees any emotion scene in a film, he cries. KIKK is a sensitive film and Bujji thoroughly enjoyed making this film. Bujji is a kind of guy who is always with you when you are in a trouble. It was Bujji suggested us the title 'Konchem Istam Konchem Kastam'. I am not the kind of guy who go for separate tracks in order to have some entertainment in the film. The characters of Brahmanandam and Venu Madhav are integrated with the story line. There is good comedy from Brahmanandam. After completion of the shoot, Brahmanandam said that the Gachibowli Diwakar (a cricketer) character played in this film would be among the top 10 roles done by him. The characters in this film are going to be lively and natural. There will not be any melodrama and cinematic cliché while designing the characterizations. Lead characters: Siddhardh is playing the role Siddhu who is an MBA graduate and a serious flirt. Tamanna is doing the role of Geeta. She is a village girl who comes to Hyderabad for her studies. Prakash Raj: Prakash Raj plays the role of hero's father. He liked the story so much that he asked for the remake rights of KIKK in two languages. Earlier I heard rumours that he is not punctual on sets. But he is punctual and perfect for KIKK film. He gave us no trouble. He gets into the script and discusses about characterizations at length. He is gifted with terrific memory. Ramya Krishna: Ramya Krishna played the role of hero's mother. Her character posses lot of attitude and it shown in Ramya Krishna. She plays a multitude of roles like mother, wife and a woman who is having a void in her life. I was so much impressed with Shankar Ehsaan Loy's work in Dil Chahta Hain that I dreamt of taking them as music directors if I direct a film in the future. I knew that they are expensive and we need to stretch our budget to sign them. When I proposed their names, they were doing a live show in Taj, Hyderabad. Bujji got in touch with them and got their consent in two hours. I approached them and narrated the story. They asked me for one line order and they promised me that the songs will help the narration of the story. All the songs in this film are a part of story narration. Hence they asked me to give details and visual description of all songs. If you carefully listen to the beats and instruments used after watching the movie, you will understand how much synchronization is there between the picturization of song, story narration and music. It was all done in tandem. If you observe Panchire song, you can listen to the railway track sound as part of song takes place in a train. If you observe Anandama song, you can see all the lyrics ending with a question mark. That is because, this song is placed at a moment when hero becomes confused and when his life is in crossroads. Shankar Mahadevan is the master composer, Ehsaan is a fine guitarist and Loy is excellent with harmony. They together created soulful music for KIKK. The best part about this music trio is that they possess hyper energy and they never get tired. They are ever-smiling and always come up with a refreshing tune patiently if we reject a tune. They are the kind of music directors who doesn't rub their work on us. They reach out for us and understand what we want instead of forcing us to accept what they want to give. Sirivennela wrote 'Konchem Istam Vunte … Konchem Kastam Anthe'. It is a terrific way of looking at positive side of struggle. Sirivennela loved the story of this film so much that he was willing to write dialogues as well if required. His encouragement for this film is awesome. He listens to the entire story and he is open to discussion. He told me to believe in my instinct and go ahead with script. My personal favorite in this album is Anandama song. Sirivennela took 18 days to pen wonderful lyrics for this song. Sirivennela penned four soulful songs. Chandrabose contribution for this album is amazing. 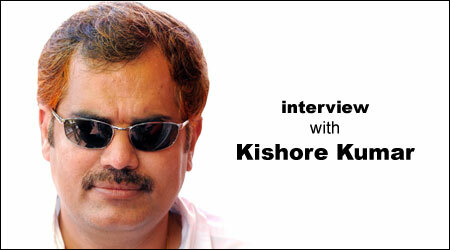 He was present and coordinating with music directors for all songs though he penned only two songs in KIKK. Vijay Chakravarthy is a cinematographer with excellent script sense. Hence it becomes easy for a director to work with him. He is a sensible cinematographer. We hired Super35 camera from Mumbai. Generally, people hire Super35 camera for action films, but we hired it for a romantic film. We are getting DI (Digital Intermediate) done in Prime Focus, Mumbai. As far as I remember, I am not inspired by any movies. If there are any similar scenes that could probably due to the inspiration I got it at subconscious level. The story of the film is inspired by the relationships I observed among my friends and cousins. If one person is selfish and irresponsible, the whole system gets upset. This film is based on that concept of human relationships. The final footage came around 14500 feet. The runtime is expected to be 2:40 hours. I am expecting a clean U certificate for KIKK. I am a huge fan of Amitabh Bachchan since childhood. My parents gave me a license to watch any Amitab Bachcan movie because they are also fans of him. I also like films with family sentiment and humor like HAHK, DDLJ etc. I am an admirer of Sanjay Leela Bhansali. He is an inspiration for me to become a film director. I like his detailing and grandeur. I wish I could assist Sanjay Leela Bhansi for at least a film. There is certain budget for music for any film. We stretched the budget beyond the limit because we wanted to get fresh music to the music lovers of Telugu cinema. All the songs in the film are sensible and situational. The first bunch of CDs were sold out in 5 days. Music is the backbone of KIKK. A lot of hard work has gone into making this music. We recorded the music with live instruments. We got the music mastering done in London. I request everybody to buy original CD as it will give encouragement for us to come up with more and more quality work. Please say no to piracy!! I have a few scripts with me now. I will decide about my next venture only after the release of KIKK.